Cabin Series 2pc Serving Set - Features a natural glaze stoneware with dark green hand painted rim. The round platter is approximately 12" in diameter and the vegetable serving bowl is 9" diameter and 2 1/2" Height. 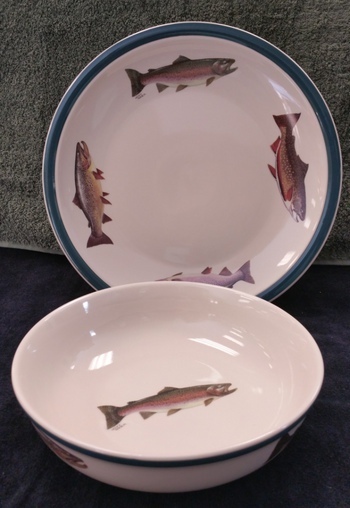 Original Artwork by Geoff Hager featuring 4 popular fresh water trout (Rainbow, Brown, Brook and Cutthroat).